Federal was a company in good old Brooklyn, New York. Their main fare was enlargers—big old tanks that were simple and heavy but virtually indestructable. A Federal was my first enlarger and I had two more after that, so I have a certain attachment to the name. As far as I know, this was their first and only meter. A shame. Most meters are variations on the same few basic ideas, but this one was quite different. It's an incident meter and you hold it upright with the dime-sized dome on the bottom facing the camera lens. There's a knob in the back of the unit, and that turns a card that's part of the meter face. 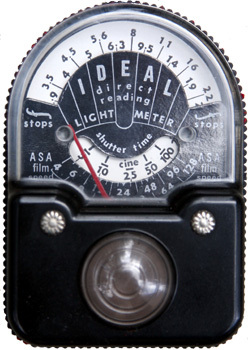 So what you do is you match up the ASA scale on the bottom against the shutter speed you want to use, and the needle direct-reads the aperture at the top. Or you turn the card until the needle points to the aperture you want, and then read the shutter speed that matches with your film speed. The only obvious problem is that the ASA index tops out at 128. 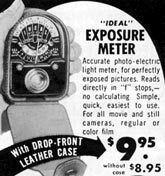 That was fairly useful for films of the 50s, but rapidly became obsolete as film speeds were increased. Another nifty little feature is that the leather case mimics the Westons, in that both the front and back were hinged flaps so you could get to both sides of this thing without physically removing it from the case. Nice touch.